Hyundai Motor Wins the ‘Car of the Year 2015'Hyundai Motor won the prestigious ‘Car of the Year 2015’ award in three categories at the 15th anniversary of the ‘Car of the Year’ award ceremony on April 23. The all-Russian survey, participated by nearly one million motorists, determines winners in 23 categories and 5 special nominations. The Genesis premium sedan ranked first in the ‘Business Class’ category. The Solaris was selected as the winner in the ‘Small Class’ category. The Hyundai Motor CIS was named the ‘Most Beloved Mass Market Brand’. The result is a distinct evidence of the company’s success in Russia. In particular, the Solaris was named the ‘Car of the Year’ for the fourth time. The compact sedan remains as one of the best sellers in its segment and has been the most popular foreign model in Russia for the past four years. The Genesis, launched in Russia in May last year, has secured a strong position in its segment, as well as winning recognition from automotive experts to motorists who gave their votes for the model as the ‘Car of the Year 2015’. The steady sales growth is another proof of the wide popularity of the Genesis that holds various international awards for safety and design. The title of the ‘Most Beloved Mass Market Brand’ is especially an important achievement for Hyundai Motor. 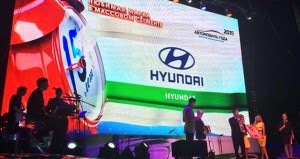 For the second year in a row, Hyundai brand won this title based on the opinions of motorists from all over the country, indicating the unique combination of traditions, experience, and technological advances needed for the success of a company and proves that Hyundai Motor is on the right track to become the most favored automotive brand in Russia.